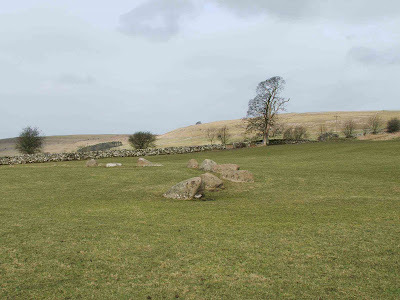 Sandwiched between the villages of Orton and Raisbeck in Cumbria, Gamelands Stone Circle lays in a field hidden behind a dry stone wall on the public footpath\bridleway, Knott lane, leading to Beacon Hill. Above. A view of the circle looking South towards the Howgills. The stone circle is collapsed now, but the stones that make up the circle would have stood around four feet tall when originally constructed. Above. Looking West towards Birkbeck Fell Common. The site is a Neolithic embanked stone circle consisting of around 30 stones, of the local ‘pink’ sandstone. The circle is pretty intact, only one side seems to be missing any stones. Above. Another view looking West towards Birkbeck Fell Common. The circle is in a beautiful setting, with Kirkby Stephen to the East, and Orton to the West, and the spectacular Cumbrian fells surrounding it.